Q: What do you mean by voice over? A: “Voice over” is a catchall term for any form of acting that requires the spoken word. It includes commercials, documentaries, animation, audio books and many other forms of narration such as corporate industrials. In New York, the home of Madison Avenue, the VO business is centered on advertising. For this reason, at Shut Up & Talk, we focus on TV and radio commercial copy. However, our instructors have experience in animation, documentaries and audio books as well. Most professional VO artists diversify and work in all genres of the business. If you are interested in VO, no matter the style, Shut Up & Talk can guide you through your career. A one-on-one coaching, in order to discuss your specific needs, is a great place to start. Q: I have a demo and I like parts of it, but not all of it. Can you help me? A: We might be able to help, depending on the files that you have from your original session. If you love your demo, but just want to add one or two spots, Shut Up & Talk can certainly help. Q: How do I know when I am ready to make a demo? A: Check with your instructor. They will let you know if they think you’re ready. If you are new to Shut Up & Talk, a coaching session is required to confirm that you are indeed ready to proceed with a recording session. This will also give your director a chance to get to know you and your voice and help determine the best copy choices. It?s very important that you only make your demo once you are truly ready to audition professionally. Q: People always tell me I have a great voice. What should I do? A: While having a wonderful speaking voice is a great gift and goes a long way to help you, successful VO artists have trained and learned what is required by the industry in order to attain success. After all, VO is ultimately just a different kind of acting that involves its own specific technique. 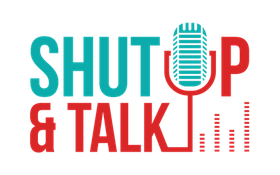 We recommend starting with a class at Shut Up & Talk so you can learn how to earn money with your wonderful voice. Q: Which path is right for me? A: All of the classes at Shut Up & Talk have an individual component. You will have the opportunity to work on a piece of copy directly with the instructor in every class while your classmates observe. You in turn will also observe while other students work with the instructor. While a group setting provides more time in the studio, a one-on-one coaching is much more intensive and personalized. The main advantage of one-on-one coaching is that students tend to progress more rapidly because of the individualized attention. Q: After taking a class, will I be ready to audition? A: While classes are a great step in the right direction, each person will proceed at a different pace. Your instructor will give you frequent feedback so you know how you are progressing.